…[T]hrough our view, contemplation, and activity, every day we are transforming commonly held internal principles into an external social reality…. The power of ceremony is that through the rituals of our day, we understand who we are. We spend plenty of time thinking about creating culture, and every thing we do is part of that. When we have these commonly held principles, how do we pass them on? We can begin with our children. We nurture and foster these principles, sharing them, cultivating them, giving the gift that they are to the youngest people we know. For they are the ones who will carry them forth and let them shine. 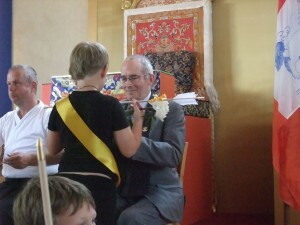 One of the ways we do this in Shambhala is through the Rites of Passage ceremony. This precious program is an opportunity to honor the transition children make into being individual members of society. Practices like kyudo (Japanese archery), calligraphy, and meditaiton are formally introduced. Children are presented with tools they can use to cultivate their own well being. 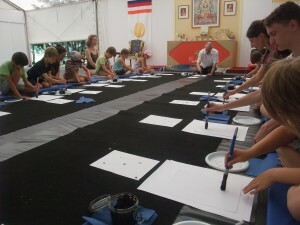 Just such a program was recently held at Dechen Choling, in central France. 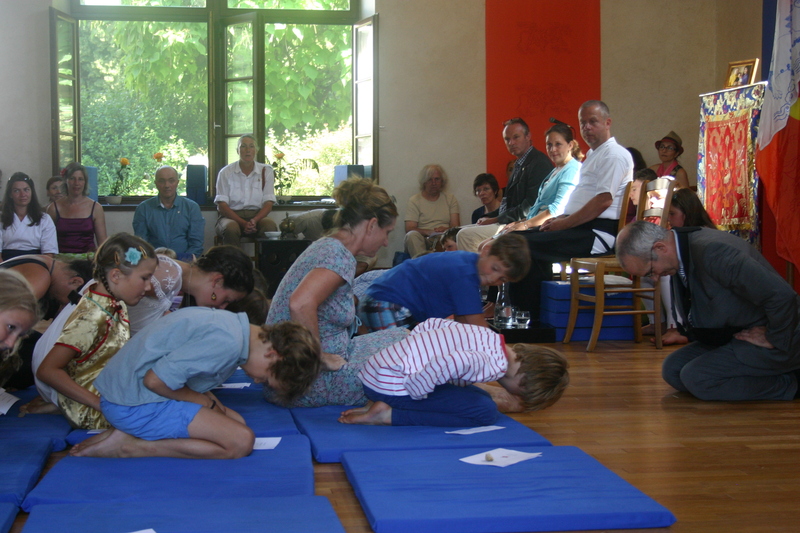 A diverse group of children, speaking several different languages all came together to experience the power of ritual. I had the great honor to speak with Acharya David Schneider, preceptor, and Liesbeth Scholten, coordinator. 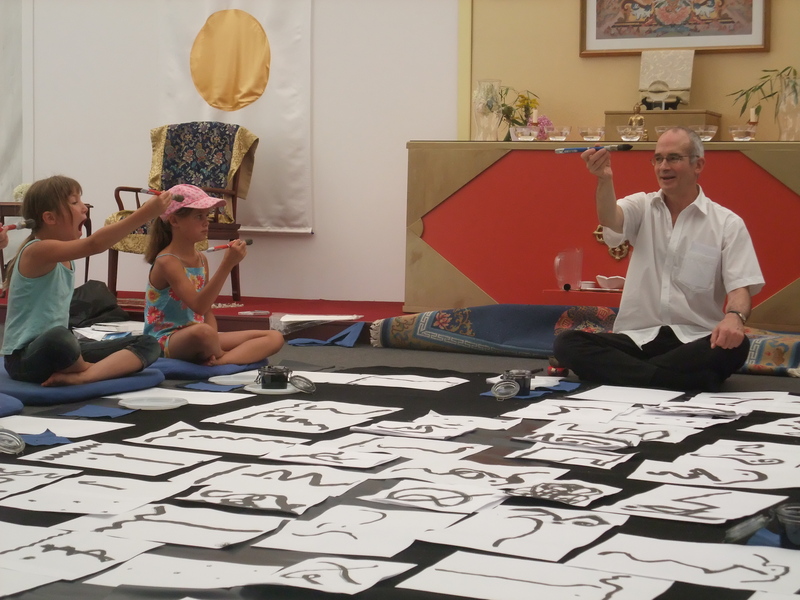 I asked Acharya Schneider about the vision of children and families in Shambhala. Reflecting upon her time there, Liesbeth gives us a glimpse of the magic of what unfolded. “Some of the highlights of the Rites of Passage program for me were the perception exercises we did with the children outdoors on the Rigden path. There is a beautiful spot with high trees, a lot of mossy green ground and a distant view of the fields through the forest. Here David led us through 10 minutes of standing meditation while paying attention to hearing. On another day we explored the visual perceptions, taking 10 minutes to turn 360 degrees paying attention to seeing. After several exercises opening up the sense perceptions, the children made poems together, inspired by their perceptions and feelings. “A favorite activity of the children was making their own bow and arrow. This actually takes several days and starts in the forest cutting the appropriate wood, followed by several carving sessions. The children were really able to handle their own pocket knives well and we saw some beautifully decorated bows come into being. Stringing the bows is always an exciting moment, as there is a risk that the bow will break, but all bows turned out to be flexible enough. A big moment was on the Kyudo platform where the children were guided by four Kyudo practitioners in the first shot ceremony. All parents, siblings and others were watching their introduction to this magical warrior practice. 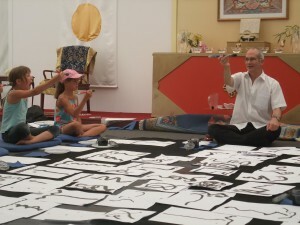 “Another powerful practice was calligraphy. The children helped with setting up the space, which resulted into a very crisp, clean and clear setup, and the children – already trained through handling weapons (knife, bow and arrow) really tuned into the discipline of working with dangerous materials, in this case brushes and black ink! 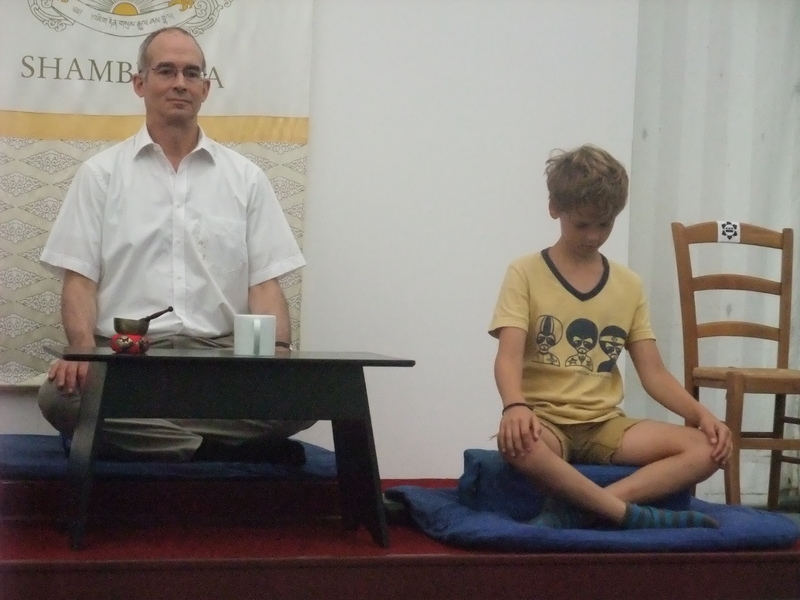 “We practiced sitting meditation every day, and here – like with adults beginning to meditate – we saw great variation in the way children experienced it, like boredom, distraction, peacefulness, relaxation. It turned out that sitting with David in front of the other children seemed to lead to a deeper meditative experience so the cushion next to the umdze seat was really in demand. There is great importance placed on the community participating in these types of ceremonies, whether members have their own children or not. It’s just like that – it really does take a village. How can we cultivate that strong sense of confidence in our culture? By being a part of it. We can claim our shared human experience, our heritage of richness, our cultural rites. Rites of Passage is offered during Family Camps at land centers, and also on occasion locally. Northern California will offer this wonderful program in spring of 2014. Contact your local center to find out more. Re-posted with permission of the author. Column originally appeared in the Shambhala Times.